The A-Star 32U4 Robot Controller LV with Raspberry Pi Bridge is a programmable module well-suited for robotics applications, designed to work either as an auxiliary controller mounted to a Raspberry Pi or as a standalone control solution for a small robot. This A-Star (abbreviated A*) is based on Atmel’s ATmega32U4 AVR microcontroller, which has built-in USB functionality, and it ships with a preloaded Arduino-compatible bootloader. Its complement of peripheral hardware includes dual motor drivers capable of delivering a continuous 1.8 A per channel, along with pushbuttons, LEDs, and an optional buzzer for building a user interface. An efficient switching voltage regulator allows the controller to work over a wide range of input voltages (2.7 V to 11 V). 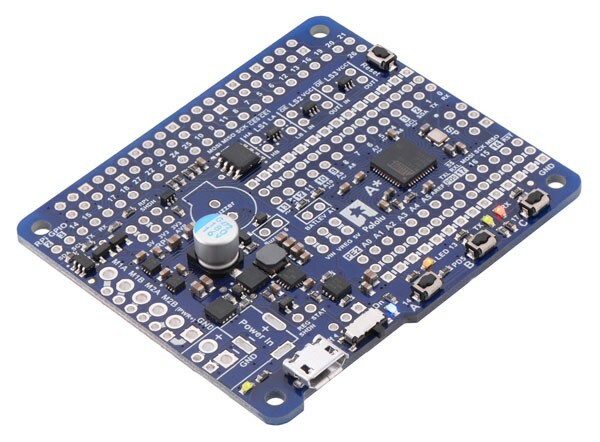 The robot controller board conforms to the Raspberry Pi HAT specification, allowing it to be used as an add-on for a Raspberry Pi with a 40-pin GPIO header (Model B+, Model A+, and Pi 2 Model B). On-board level shifters make it easy to set up I²C communication and interface other signals between the two controllers, and the A-Star automatically supplies 5 V power to an attached Raspberry Pi. In this setup, the Raspberry Pi can handle the high-level robot control while relying on the A-Star for low-level tasks like reading analog sensors and controlling timing-sensitive devices (e.g. servos). Our comprehensive user’s guide provides the basics you need to get started with the A-Star as well as detailed technical information for advanced users. A-Star 32U4 Robot Controller LV with Raspberry Pi Bridge (SMT components only). This version of the A-Star 32U4 Robot Controller LV with Raspberry Pi Bridge does not include any through-hole components. It ships as shown in the picture above, without any male or female headers, terminal blocks, DC power jack, buzzer, or Raspberry Pi mounting hardware. This configuration is intended for those who want to use the board as a standalone robot controller or customize the way it is assembled for use with a Raspberry Pi. For a version assembled with selected through-hole parts for use as a Raspberry Pi add-on and with mounting hardware included, see item #3117.